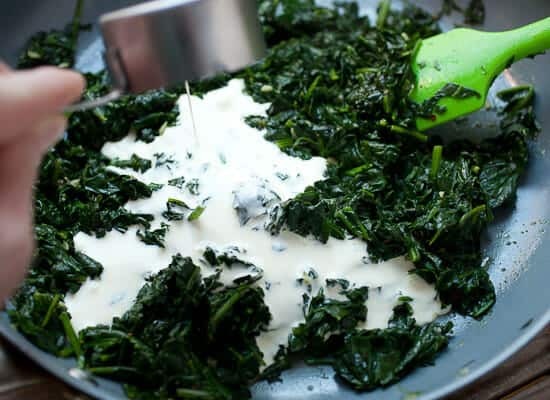 I first came up with this fast and easy Creamed Spinach Breakfast Bowl recipe after Betsy and I had brunch one weekend at a local Denver spot called Lucille’s that we’ve had on our restaurant/brunch list for a very long time. It’s a creole place and sometimes you’ll have 1-2 hour waits during brunch. I simply refuse to wait that long for eggs, but if you get in early you can beat the rush, which we were mostly able to do. I had a dish I’d never heard of before called Eggs Sardou which is essentially eggs benedict with creamed spinach and shrimp (plus home fries and a biscuit as big as my head). I ordered it because I’d never heard of it before. 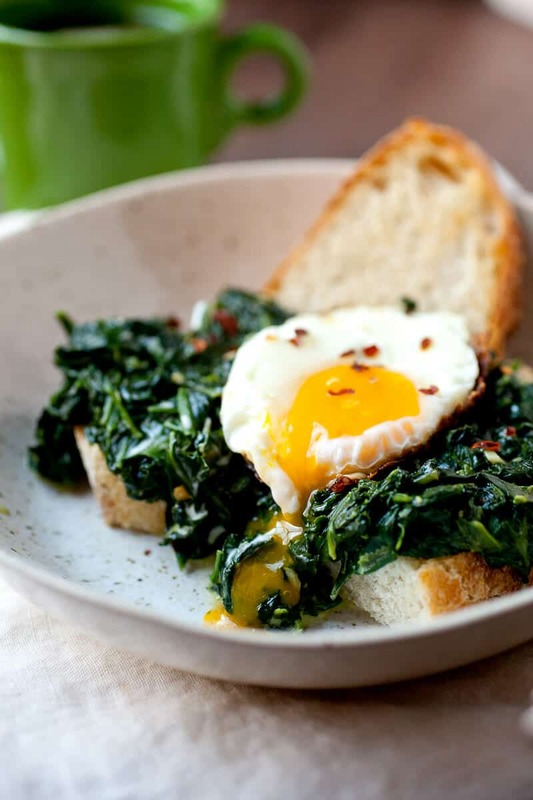 It kind of rocked my world and ever since then I’ve been dreaming about spinach breakfast recipes that have an egg on them. This spinach breakfast bowl is my simplified version of that dish. You could jazz it up with home fries or make it full benedict with hollandaise sauce, but for a quick breakfast it’s pretty hard to beat just like this. I like to serve it as a breakfast bowl because it gets a little messy (in a good way) as you dive into it. Updated 03/03/2019 to add new photos and spiffy up the text! 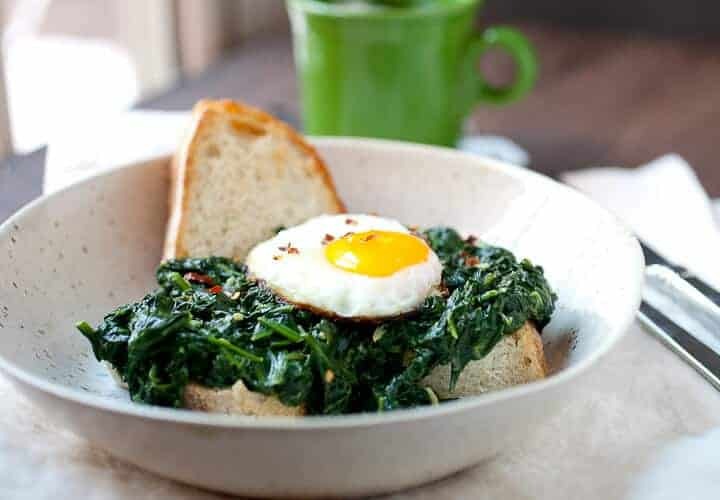 Slightly spicy creamed spinach simmered slowly and served over chunky bread with a crispy fried egg. Simple comfort food! 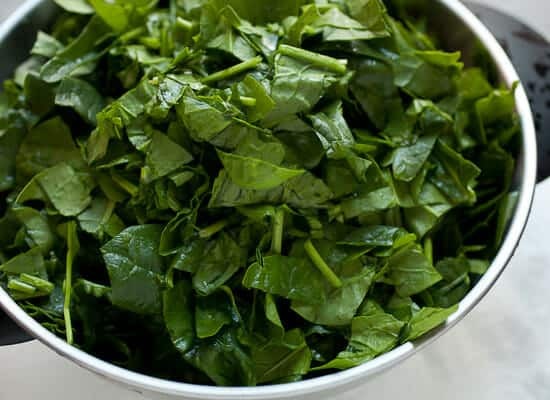 1) Cut stems off of spinach (some stems are okay) and rinse well. Then chop spinach and let drain in a colander. 2) In a large skillet, add butter and olive oil over medium-low heat. Once melted, add garlic and cook for 30 seconds. 3) Add spinach and cover. 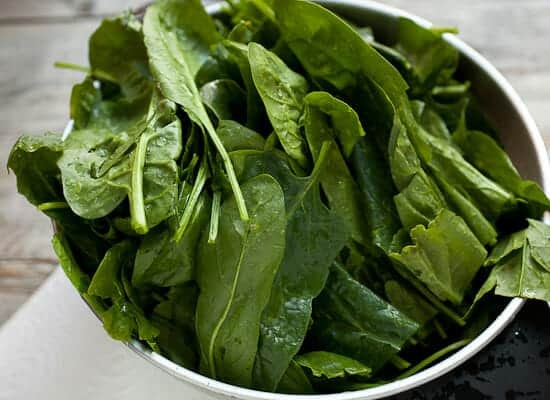 Let spinach steam and cook until wilted, 4-5 minutes. 4) Remove lid and season with red pepper flakes, ground nutmeg, and a pinch of salt and pepper. Let cook until water evaporates from the skillet. 5) Turn heat down to low and stir in milk and cream. Continue to cook on low for 5-6 minutes until mixture is thick. 6) Meanwhile, toast bread and fry eggs in a little olive oil. Stack toast in a bowl and spoon over creamed spinach. Be sure to get plenty of the cooking liquid. Serve topped with an egg and extra toast on the side. 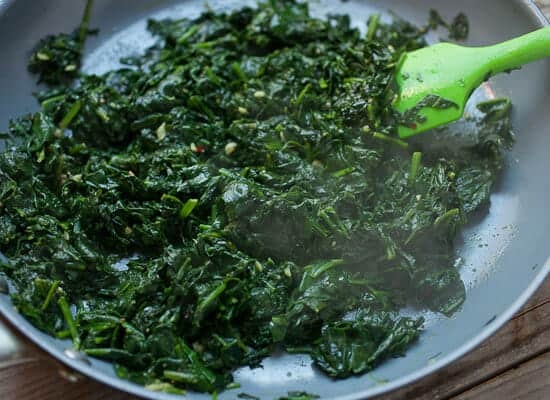 The two important things about making really good creamed spinach are: 1) Make sure you wash it well and chop off most the stems and 2) cook it over low heat so it doesn’t get bitter. Rinse the spinach really well. Like, get in there. Then chop off most the stems (you don’t have to be crazy about it). I usually just do one clean chop of most of the stems and call it good. Then roughly chop up the spinach and let it drain. 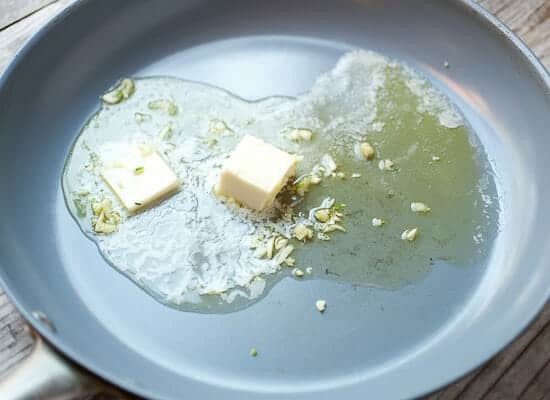 When you’re ready to cook, add some olive oil, butter, and garlic to a large skillet. Put this over medium-low heat and let the butter melt and get the garlic cooking. Basically when the butter is melted and the garlic is fragrant (not brown at all), add in all the spinach. It’ll look like a mountain. Cover this and let the spinach wilt down for 4-5 minutes. Then remove the cover and season the spinach with salt, pepper, red pepper flakes, and nutmeg. When the spinach is looking almost dry, it’s time to turn the heat down to low and add the milk and cream. I like adding both. If you go to the south, there will be more cream in creamed spinach than in this recipe, but I think this is an adequate amount. This is obviously a great side dish just like this! Keep the egg simple here, people. Add some olive oil to a small skillet over medium heat. When it’s hot, crack in an egg and let it cook for 1-2 minutes. 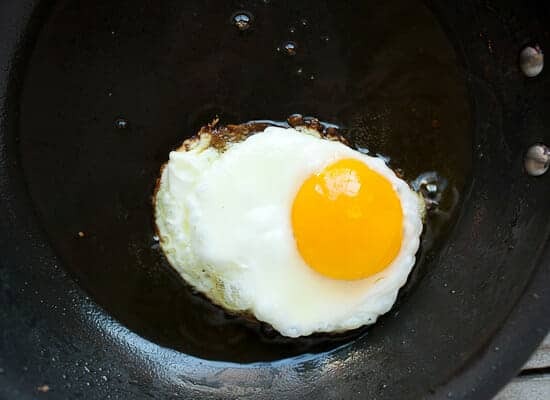 You can flip it for an over-easy egg or just cover it up and let it steam for 30 seconds for a sunny side up egg. Variations are many. You could add bacon or shrimp if you wanted something heartier. You could serve it over potatoes instead of crusty bread. Personally though, this is an easy spinach breakfast and worth the little work of dealing with the fresh spinach. I like to serve my creamed spinach breakfast bowls on a piece of crusty bread with a little wedge on the side as well. Alright. Creamed spinach fans. Where are ya? Leave a comment! Here are a few other Breakfast Bowl Ideas! I adore Lucilles and can’t wait to try one of their recipes at home. Any thoughts on their biscuit recipe? Those biscuits seem to make every dish! Oh man. I wish! Those biscuits were awesome. I know they baked them in a huge sheet pan. They were flaky but also had a nice crust on top. No idea on that recipe! This looks delicious. 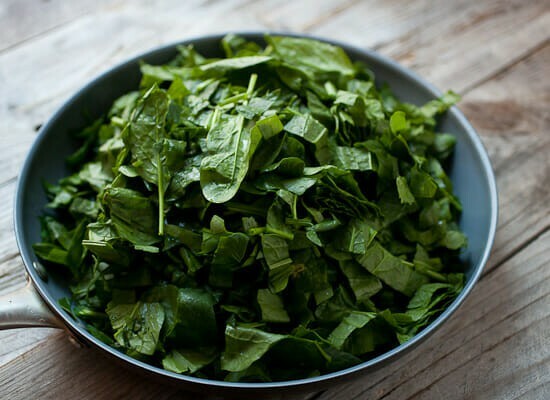 Using pre-washed baby spinach will save you the work of cleaning the spinach and chopping off the stems (baby spinach stems are tender and not bitter). I was about to shut my computer and hit the bed then I saw your newsletter and O, My! 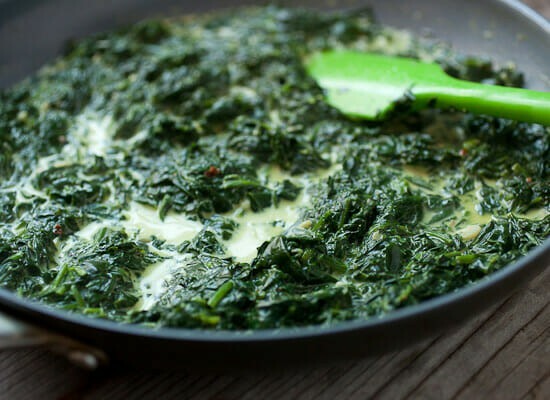 the sight of the “Creamed Spinach” made me want to have breakfast right away. LOL! But never mind I’ll save it for the morning!! Fixing this NOW, looks yummy! Love, Love spinach, so this is a no brainer for me! It will be for breakfast tomorrow!! And I must say I agree about the one bowl meal, it is just comforting somehow! All year long. I had lots of organic spinach and wondering how do i cook it for the little ones’ breakfast. Perfect idea! Thanks! Yum! Just made this for brunch. Absolutely delicious!